Venezuela Slashes 5 Zeros From Currency In "One Of Greatest Devaluations Ever"
As previewed yesterday, on Monday Venezuela officially slashed five zeros from prices and its currency as part of what has been dubbed one of the greatest currency devaluations in history which slashed the value of the official bolivar by 95%, an overhaul that President Nicolas Maduro said would tame hyperinflation, and which everyone else called the latest desperate failed socialist policy that will push the chaotic country deeper into crisis and unleash even higher hyperinflation (impossible as that may sound: as a reminder the collapse of Venezuela's currency recently surpassed the Weimar republic). As part of the devaluation, the official rate for the currency will go from about 285,000 per dollar to 6 million and together with salaries and prices, will be pegged to the Petro cryptocurrency which is reportedly backed by crude oil and is valued by the government at $60, or 3,600 sovereign bolivars. The Petro will fluctuate and be used to set prices for goods. Government officials tried to partly mask the shock by raising the minimum wage 3,500% so instead of the new minimum wage being 1.8 million strong bolivars, it will be 1,800 sovereign bolivars: the equivalent of $30 a month. Banks were closed and busy trying to adopt ATMs and online platforms to the new currency rules; they will likely fail. Less discussed was the concurrent increase in the value added tax by 4%, while officials also ended some gasoline subsidies, saving the government $10 billion a year, as many ordinary citizens are forced to switch from subsidized to western fuel prices. Even though Maduro boasted in Friday night’s announcement that the IMF wasn’t involved in the policies, aspects of the moves bore a resemblance to a classic orthodox economic adjustment, even if those usually involve removal of the corrupt regime whereas Maduro is only becoming more entrenched. Meanwhile, most economists said the plan announced on Friday will escalate the crisis facing the once-prosperous country that is now suffering from Soviet-style product shortages and a mass exodus of citizens fleeing for nearby South American countries. There were no riots - or celebrations - on Monday, however: streets were deserted and shops were closed due to a national holiday that Maduro decreed for the first day of the new pricing plan for the stricken economy, which the International Monetary Fund has estimated will have 1 million percent inflation by year end. 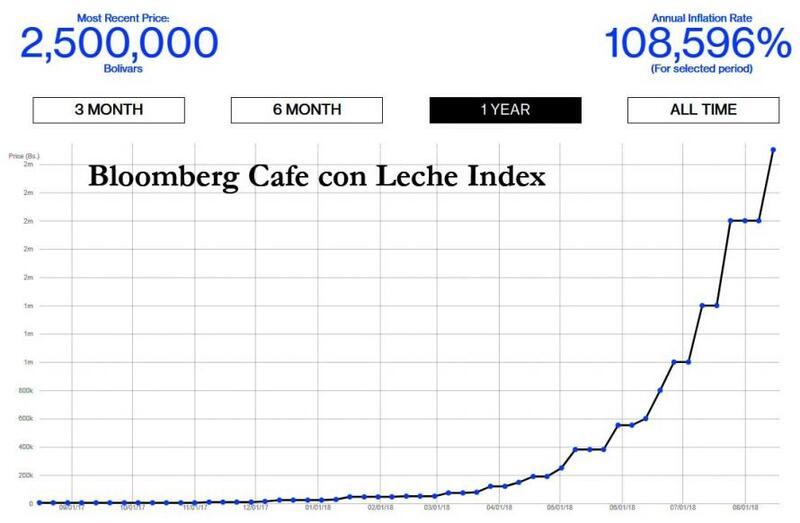 Venezuela is already well on its way:according to the Bloomberg Cafe Con Leche index - which tracks the price of a cup of coffee - inflation in Venezuela has hit an annual inflation rate of 108,596%. In many ways the devaluation is a mere formality. For years now, most people and companies have been unable to access dollars at government-set rates and have been purchasing them in the black market. As a result, the prices on many goods across the country are already based on that exchange rate. "They had to do this because they ran out of money," Moises Naim, a fellow at the Carnegie Endowment and a former minister in Venezuela, said from Washington. He pointed out that oil production -- pretty much the country’s sole industry at this point -- has plummeted in recent years amid a shortage of equipment and technical expertise, foreign reserves have plummeted and allies such as China and Russia are providing less support. 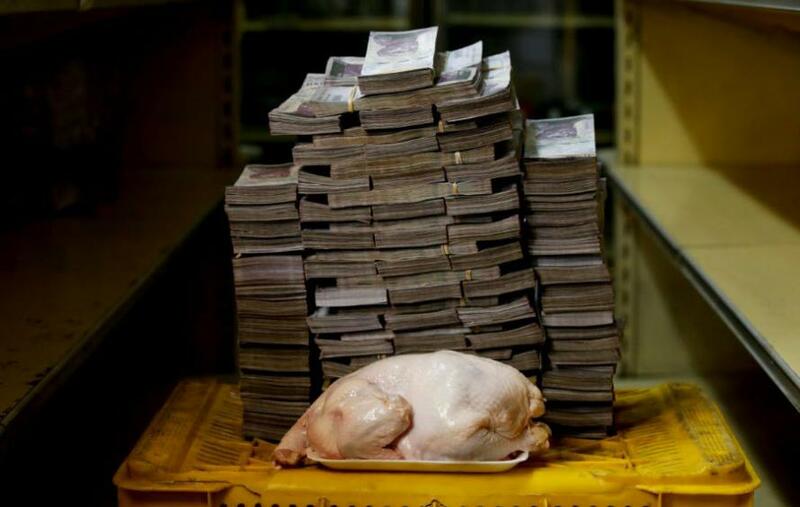 As for ordinary Venezuelans they were mostly baffled by the monetary overhaul and skeptical it will achieve anything. "This is out of control, prices are sky high," said Betzabeth Linares, 47, in a supermarket in the central city of Valencia. "What worries me is how we’ll eat, the truth is that the way things are going, I really don’t know. Most local businesses were shocked by the announcement: the new measures spooked shopkeepers already struggling to stay afloat due to hyperinflation, government-set prices for goods ranging from flour to diapers, and strict currency controls that crimp imports. Private companies, already dealing with hyperinflation, years of brain drain, price controls and threats of seizure, now must deal with even faster inflation and mandatory wage hikes. It’s also possible that the exodus of Venezuelans to other countries will increase, even as Ecuador and Peru announced entry restrictions and tensions flared along the border with Brazil. "People are leaving because of a feeling of despair, and the desperation will now increase," Naim said. But the biggest question is how the military, without whose support Maduro will be swept from office overnight, would react. It was not immediately clear how the shock measures will sit with the local military which already runs much of the nation. Top ranking generals have been handed the keys to ministries, the state-run oil company and the lucrative business of food imports. Myriad exchange rates created juicy arbitrage opportunities that enriched many close associates of the state. For now there is little hope that the official opposition, a fragmented group of parties whose leaders are either in hiding or in jail, can stir a popular uprising: Together with several labor unions, the opposition called for protests against the measures Tuesday as well as a 24-hour national strike. It was not immediately clear if anyone turned up. Maduro, who was re-elected to a second term in May in a vote many said was rigged, has said his government is the victim of an “economic war” led by political adversaries with the help Washington, and accuses the United States of seeking to overthrow him. While the US has denied the accusations, it has described the former bus driver and union leader as a dictator and levied several rounds of financial sanctions against his government and top officials.